In a large bowl, mix together the flour, yeast, sugar and salt until well combined. Turn the dough out onto a lightly floured work surface and knead lightly for 8-10 minutes, or until smooth and elastic. 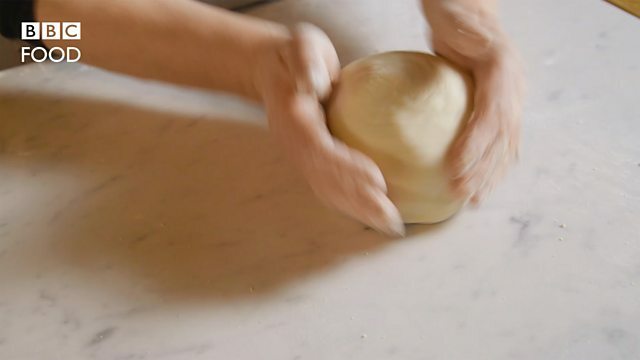 Transfer the kneaded dough to a clean, greased bowl and cover with a greased sheet of cling film. Set aside in a warm place to rise (prove) for at least one hour, or until the dough has doubled in size. Meanwhile, in a separate bowl, cream together the butter and lard until well combined. Divide the mixture into four equal portions. When the dough has proved, turn it out onto a lightly floured surface and knead for a further 1-2 minutes. Roll out the dough into a 40cm x 20cm/16in x 8in rectangle, about 1cm/½in thick. Turn the dough around so that the shortest edge is facing you. Spread one portion of the butter and lard mixture over the bottom two-thirds of the dough rectangle. Fold the remaining one-third of the dough rectangle over onto the butter and lard mixture to cover the centre section of the dough rectangle. Fold the other end of the dough rectangle over the folded dough, so that the dough ends up three times its original thickness. Roll the dough out again to a 40cm x 20cm/16in x 8in rectangle, about 1cm/½in thick. Repeat the process of spreading and folding with another portion of the butter and lard mixture. Repeat the process twice more, until all of the butter and lard mixture has been used up and the dough has been rolled out a total of four times. Roll the dough out again to a 40cm x 20cm/16in x 8in rectangle, about 1cm/½in thick. Cut the dough into 16 pieces and roll each into a round, flat bun shape. Transfer the buns to a lightly oiled baking tray and set aside for 40-45 minutes, or until they have doubled in size again (leave enough space between them for expansion). When the buns have risen, bake them in the oven for 15-18 minutes, or until they have risen further and are golden-brown and cooked through. Set aside to cool on a wire rack. Serve each buttery warm, spread with butter and jam.